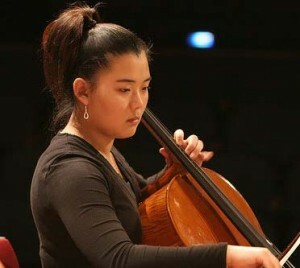 Joyce Park (cello) was 17 and a senior at Piedmont High School when she won the 2009 Khuner Concerto Competition, after studying cello for seven years with Wendy Howe. At that time she was co-principal cellist of the Young People’s Symphony Orchestra, having been a member for five seasons. She won YPSO’s concerto competition, performing the Kabalevsky Cello Concerto. She was principal cellist for the Bay of Hope Concert Finale Orchestra at Davies Symphony Hall in January 2009. In 2008, Joyce won the principal chair of the California Music Educators’ Association All-State Honor Orchestra and was awarded the Maestro Award for outstanding solo for her performance at the Heritage Music Festival in San Diego. In 2007, she won 2nd Place in the Junior Division of the Etude Club in Berkeley. She performed in the Junior Bach Music Festival in 2006, 2007, and 2008. She was a member of Berkeley Youth Orchestra, and a scholarship student at Spark, the California State Summer School for the Arts, as well as La Honda Music Camp. Joyce received Command Performances at CMEA adjudications for both solo and ensemble performances in 2004, 2005, 2006, 2007 and 2008.